In 2013, the Florida Court Clerks and Comptrollers (FCCC) launched a statewide e-filing portal for civil, criminal, and Florida Supreme Court cases. As usually happens with technological changes, many legal professionals were caught off guard. Navigating drop-down menus and searching for the right documents can be very confusing. So what are some things Florida lawyers can do to make using the portal easier? 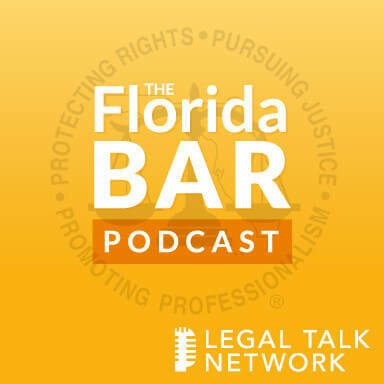 In this episode of The Florida Bar Podcast, Adriana Linares interviews Carolyn Weber, program manager for the design and implementation of the portal, and Tom Hall, lawyer and consultant to the FCCC. Together, they discuss the major issues lawyers have with the Florida Courts E-Filing Portal and tips on document requirements. Weber mentions the main subjects called in to support staff and suggests that lawyers watch the various YouTube videos that explain each page of the portal. Hall explains that attorneys, in fact, should give their documents generic names (most attorneys prefer to be specific). Listen to the end to learn about removing metadata properly or potentially revealing attorney-client privilege information. Carolyn Weber has designed, developed, and implemented automated document production programs, electronic case filing, and case management systems for the United States District Court, Middle District of Florida and the Orange County Clerk of Courts. In 2013, she joined the FCCC in November 2012 as Program Manager to help in the design and implementation of the Florida Courts E-Filing Portal. Tom Hall is an appellate attorney with The Mills Firm in Tallahassee, Florida. He is also President of TLH Consulting Group and he currently serves as a consultant to the FCCC providing non-legal advice to the Portal Authority Board. Hall serves as vice chair of the Technology Committee of The Florida Bar’s Vision 2016 Commission. Adriana Linares: Hello and welcome to the official Florida Bar Podcast brought to you by the Practice Resource Institute on Legal Talk Network. The Practice Resource Institute is the Florida Bar’s online center for practice management information, dedicated to Florida attorneys. My name is Adriana Linares, and I’ll be your host today. I’m a legal technology consultant and trainer, I’ve been working in Florida and fortunately for the Florida Bar as a consultant over the past couple of years, although I shouldn’t say I have been working in Florida for the past couple of years. It’s been 15 years that I’ve been helping lawyers and law firms across the state with their technology and practice management issues and needs. And today I’m very excited to be talking about a topic that is always coming up, having to deal with e-filing. We have two great guests on the show today, Mr. Tom Hall and Ms. Carolyn Weber. Tom is an appellate attorney with The Mills Firm in Tallahassee. Before he joined that firm, he was the clerk of courts for the Supreme Court of Florida for a whole 13 years. And before that, he was the chief staff attorney at the Florida District Court of Appeals. He also served on the board of directors for the Florida Court’s E-Filing Authorities. The authority of course operates Florida’s statewide e-filing portal. Today he serves as a consultant to the Florida Court Clerks & Controllers and in that capacity provides non-legal advice to the Portal Authority Board. I happen to know Tom because we both get to work on The Florida Bar’s Vision 2016 Commission and he serves as the vice chair of the technology committee of that commission and we know that they’re doing all kinds of good work because we’ve had Jon Stewart, who is the chair on that committee, on one of our previous episodes. Carolyn Weber worked with the United States District Court Middle District of Florida for 24 years. She designed, developed, and implemented an automated document production programs for the judiciary and the clerks. She was instrumental in the design and implementation of CMECF for the Middle District. She worked with the Orange County Clerk of Courts for 6 years in which she designed and implemented their ECF for the circuit, civil, and probate divisions. Man, you two have had a lot of experience in helping attorneys and judiciary and legal professionals get through all this stuff, haven’t you, Tom? Tom Hall: Yeah, we have, and one of the great things I think about this statewide portal is bringing Carolyn on as the new director who’s running the system at this point and making all the improvements that we have to keep going forward. It’s a great program, but as with all technology, it constantly needs tweaking. So it’s great to have her working with us now. Adriana Linares: And welcome, Carolyn, that must be a pretty big job to face every day. Carolyn Weber: Actually, it’s a joy. I love what I do, I’m accomplishing a goal that I had set for myself a few years ago, so I love what I’m doing. Adriana Linares: Well that’s great to hear. Tell us a little bit from your perspective, Carolyn, what’s been going on when you joined as program manager. What were the biggest issues that you saw and decided to tackle first? Carolyn Weber: So when I joined FCCC, which was a couple of years ago now, two and a half year ago, we were deep in the process of meeting all of the Florida Supreme Court deadlines and trying to get the counties all on board electronically in the civil divisions. They had to be off filing in civil by April 2013. And then shortly thereafter in October, we needed to get criminal up in e=filing. So when I first started, we were just working fast and furious trying to get the counties all on board and trying to get all the training out to attorneys and trying to meet the deadlines that had been established. Adriana Linares: Gone pretty well. Carolyn Weber: It’s gone very well. We were able to get all of our counties on board in civil. We still have just a few that we’re still waiting to get on board on the criminal side. We have our state attorney office and our public defenders offices doing what we refer to as batch filing which is a machine to a machine type of filing. We also have our judges filing orders electronically through the portal and it’s going very well. And now we’re in the process of taking a step back and looking at some improvements that we can make and still adding more functionality to the portal to streamline the process and allow more users access to the portal. Adriana Linares: That’s great. And Tom, tell us a little bit about what your role has been but even more so sort of as Carolyn describes the things that we’re looking to improve and get better, where you come in on that and what you’re looking to see happen. Tom Hall: One of the things that’s sort of unique about my position as a consultant with the portal is that I’m also a practicing attorney. So I use the portal every day and that’s been a real difference for me. It’s different from when I clerk of the court and sat on the portal board. In many ways you’re talking about it in a sort of 20,000 foot abstract level. But when you actually – as an attorney – start using it every day, you see those little things that could make it better. And I think my experience of using the portal every day and then talking to Carolyn and say I tried to do this and it won’t do that, has really helped me in trying to give some real practical advice to the portal authority board about improvements we could make that would just make it a lot easier. The average attorney is doing this stuff for themselves so they can really use the portal effectively. Adriana Linares: Well absolutely, and of course it’s the attorneys as well as their assistants and staff and I have certainly, in my experience, witnessed over the past couple of years less and less issues and complaints and people really finding it easy and useful to go and file and look up their documents. I wanted to use this opportunity to have both of you on here as a way to get as much useful information as possible out to the attorneys and perhaps their support staff that also use the portal and their system. So I just wanted to start by asking you what are the one or two most common issues that people face when they go to use the system that perhaps you all get a lot of phone calls or emails or support questions about that we could help diminish as time goes on. Carolyn, do you want to give us a couple of those? Carolyn Weber: Well, probably the primary phone call to the support center receives is from people who have forgotten their passwords. But after that, when you get into the portal, probably the largest number of phone calls seem to come from the attorneys when they’re trying to select the document that they would like to file. It depends on the county that you’re filing to on the civil side. One of our goals, the goal of Justice Polston, and also of the e-filing authority board is to standardize our 67 counties in those dropdowns on the civil side. We did that when we implemented the criminal, but we had a bit more time to work with. So on the civil side, those are still not standardized. So depending on the county that you go to, the dropdown that you see, which give you the documents you have to select from, is going to be a little bit different. So that’s probably the biggest confusing factor because they can not find the exact name of the document that they’re filing and they don’t know what to do at that point. Adriana Linares: And is that because they don’t necessarily use standardized naming conventions for their files or is it just sort of innate to the system and eventually that will get better over time? Carolyn Weber: Well, attorneys have become very creative as to the way they name their documents. And so the clerks before, in the paperworld, when they got a document in, if they didn’t have a docket code for whatever the document was in front of them, they would just create a new one. They might only use it one time for that one document, so they ended up upon thousands upon thousands of docket codes in their case maintenance system. So when you go to a system like the portal, or you’re presenting the attorneys a dropdown list or a search page of documents to file, you can’t provide thousands upon thousands of documents to choose from. So the standardization process is time consuming, but it’s going to narrow it down so you have a more standard document name. A motion to dismiss is a motion to dismiss no matter who files it. So that’s kind of the path we’re trying to go down. Next is to get those documents the same in every county you would file to. And it might mean the clerk filers will have to rename their document or not be quite creative in the name of their document or they can call it whatever they want and choose the document that most closely resembles the document that they’re going to file. Adriana Linares: And Tom, as a consultant and someone who’s helped bring all this to life but really more so from the perspective of an actual attorney who’s using the system, do you have any tips or advice for helping people navigate those dropdowns and find the documents that they’re looking for or the information otherwise? Any tips from the ground? Tom Hall: Yeah, I think one of the things that attorneys have to remember is that no matter how creative they are about naming their document, the reality is even when they filed the paper, it was pretty standard for a clerk to pick from that list of choices they had available within that case management system. And that’s what they would actually docket the document as, not necessarily what the attorney called it. So when you’re trying to pick something, if you stay as generic as possible like it’s a motion to lift the appeal or a motion to strike the answer brief or whatever it is that wherever you’re at, you’re going to be way better off. Because ultimately what’s going to happen is if you name it at a very high generic level, select that, the clerk’s office is going to take it. And if they have these more detailed docketing codes that they’re going to use in their case management system, they’re just going to reselect that and put that in. So you really don’t have to be that specific when you’re filing the document. And it makes it much easier for the attorneys to do it that way. Adriana Linares: Great, well that sounds like pretty darn good advice and something that hopefully people will start paying attention to. I definitely get that they want to get creative with it when they’re naming the files because they have so many and they’re trying to come up with a system where internally they can identify things but also be able to find them in the system so that makes perfect sense to me. Well, we’re going to stop for just a quick second and take a quick break. And when we come back, I’m actually going to backtrack a little bit and address Carolyn’s first issue that she brought up which was the passwords because we skipped over that. But I have a couple of questions I do want to ask, so we’re going to take just a short break and we’ll be right back. Adriana Linares: Welcome back to the official Florida Bar Podcast. I’m Adriana Linares and with me today are Tom Hall and Carolyn Weber. Before the break, we were chatting about navigating many of the dropdowns that are encountered when attorneys or others are looking for their documents in the various county’s portals; they’re a little bit different, it can be confusing. Tom gave us a great tip about just trying to stay pretty generic with those naming conventions that helps you, helps the system and helps others. And one of the things that Carolyn mentioned before we started talking about the document dropdowns and dropping names is that a lot of people are calling in because they’ve forgotten their password. Carolyn, my question for you is when people actually call the hotline, the phone number, are your helpdesk folks just navigating them back to the website and asking them to click the forgot password link? Or are they actually helping them with the password? Because I wonder could you mitigate some of those calls that you’re getting if all they’re doing is navigating them back to the system. Carolyn Weber: Yes, most of the time they just tell them about the forgot password link. So when those calls come in, they’re answered fairly quickly and the forgot password link which is right on the front page of the Florida court’s e-filing portal website will get them access to a new, temporary password and give them the ability to log back in and then make them change their password. And we only suggest that they write that new password down somewhere so that they don’t forget it. Adriana Linares: Right, well that makes sense. I assume like the rest of us, we all think it’s just going to be faster to place a phone call and get that password reset. But you can’t reset it for them, you’re just going to point them back there and say put in your username and your primary email address or a couple of security questions. I’m looking at the site right now and it’s pretty easy. I’d imagine that that ability to reset your password is immediate and probably by the time you’ve dialed the phone number and gone through the prompts, if there are any, that email link to reset your password has already landed in your inbox. Carolyn Weber: That is correct. And we also have help menus on there. If you look on that homepage, you’ll see that there’s a video icon over to the right and then a question mark; well that’s help information. So if they want to quickly take a look at any information that pertains to that particular page that they’re on, they can click that video and a YouTube will open in a new window and explain to them what they’re looking at. So it does talk about the forgot password link. Adriana Linares: Yeah, that’s great. I’m looking at your YouTube page now, you all have quite a gallery of videos. They’re not very long, some of them are 2 minutes long, 13, 14, 9 minutes. And like you said, the link to go to the YouTube page where all these training and explanation videos are is right on the homepage of the Florida court’s e-filing portal. So that’s very helpful for them, great. Another quick question for you. I’m wondering when there are new administrative orders that come out; and I think you had one just last year that was maybe, quote, “big.” What advice can you give to our listeners about meeting those requirements and if you want to specifically address the latest one about searchable PDFs, that would be helpful. Tom, do you want to take that one? Tom Hall: Yeah, I’ll take it. And let me just follow up on something that Carolyn said right before that. I think one of the best things about the videos that are on there is that you can watch a whole big long training video that tells you all about the system. But also, they are broken down into very small, discreet parts. So if you’re looking for one specific thing that you want to learn, you can go to maybe a 2-minute video that will explain just that part that you want to know. And I think people really need to understand that and it’s really, really helpful. In fact, generally when I go out and teach about how to use the portal, one of the things I really concentrate on is really trying to teach people that what they really need to know is how to go out and find the videos, because the video’s are going to tell them how to do stuff way better than actually I can tell them. But in terms of new stuff and orders that get entered, it’s just the typical thing of understanding that they really have to understand what that order says and really make use of it. And then, if they have problems, calling the helpdesk; the helpdesk is manned during the day. And what we generally encourage people to do rather than making a call is send an email, because those emails then get triaged so that the ones that really require a quick response can be responded to, and the ones that are more of a longrange question can be put off and it actually helps for far more efficient use to the people handling the helpdesk and they can get to the people that need immediate help much, much quicker. Adriana Linares: Well that’s great, and I bet you’ve been getting a lot of questions about the searchable PDF requirement that came out recently. Do either one of you want to give us a couple of tips on helping attorneys figure out how to meet those requirements? Carolyn do you want to start? And then we’ll turn to Tom who’s got the practical experience and get some advice from him? Carolyn Weber: Sure. My first suggestion is don’t create your document in your word processor and then print it out, sign it, and then scan your document and file it. The best way to create your document, use your word processor, use the s-slash and your typewritten name, which is the official electronic signature, and then save your document as a PDF. That will create a searchable pDF, a much smaller file than if you scan it, and all you have to do then is to log into the portal and submit your document, then you’ve met those requirements. There’s also the one-inch margin requirement which will allow us to embed the official file stamp of the document from the portal in the upper lefthand corner, and then the supreme court and the district courts of appeal and the trial courts have the other sides of the document. So that one-inch margin is necessary. Adriana Linares: That’s very helpful. And I’ll just throw in a couple of little technical things to really help clarify even further what you were saying, Carolyn. I see this all the time when I go into law firms exactly what you said, where they are printing the document out, signing it – or not – but then running it through the scanner. Most modern word processors, actually all of them, whether it’s if you’re a Mac user and you’re using Word or Pages, or if you’re a Word user and have 2007, 20010 or 2013, both of those very common and typical – of course Word is going to be the most popular – word processor save directly to PDF. So that would be a file save as, you change the document type from Doc to PDF and you never have to print that document. Whenever a computer creates a PDF file for you, it’s automatically searchable. I’d assume that the issues that you’re getting in those questions when callers are calling in is because they did exactly that. They ran it through a scanner and the scanner either isn’t equipped or they didn’t know that they had to then turn around and make it searchable. So hopefully that will give some attorneys who might be listening in and were a little bit confused about that a couple of tips. Tom, do you have some practical tips from the attorney’s perspective? Tom Hall: Well, I think the most practical tip is that every attorney ought to have somebody in their office who really knows all of these little things that you have to do to really make it work. And while attorneys certainly should know that, it’s amazing how much you could get online to learn all those things. I switched from being a Windows user to a Mac user about two years ago. And at first I struggled with the Mac, but I found, just by going out and doing a typical Google search, I found videos that showed me how to use my Mac, how to use Word documents on my Mac, all of that stuff. And it really is just a matter of sitting down and spending the time to do it and it’s not that difficult if you really take a little time to research it and a little time to learn it and study it. Because there’s really all kinds of training out there that overcome virtually all of these problems. And I think attorneys should learn how to do it themselves, it makes them much more efficient to be able to do it. But also I think every law firm ought to have somebody dedicated who knows how to do these things to make sure that all of these things get down right. Another thing I want to add that Carolyn said about the one-inch margin, the rule also requires that if the document is going to be recorded in the official records, it has to have a 3×3 inch margin up in the top righthand side of the first page so that there is room for putting the recording information from the clerk’s recorded in the official records. And you have to understand what documents are going to get recorded and what documents might. And I would suggest to anybody at any doubt that at the local clerk’s office, before they file it and ask, “I’m getting ready to file a notice of appeal. Is that going to be a document that is going to be recorded?” And if it is, then they can make sure they put that 3×3-inch margin up at the top and not just the 1×1-inch margin. Adriana Linares: Great, very helpful. And the last thing I’ll ask you before we sign off – and this has been very informative and very helpful – is that I noticed, Carolyn, you just put up a new video not that long ago on YouTube about removing metadata from the documents and I bet that’s been something that has come up a lot lately. Metadata is one of those things that maybe we don’t know too much about and I can imagine it’s causing some sort of confusion out there. Do you want to talk to us a little bit about what that means and then maybe Tom can tell us how to remove metadata properly. Carolyn Weber: Well I did do that metadata YouTube not too long ago, it’s a very easy process through Word. It just removes any of the user identifiers within your document so that those aren’t then sent into the portal and accompanies the document when it goes into the clerk’s case maintenance system. So it’s done through your word processor and then the video is just a couple of minutes long. It doesn’t take very long but it does allow you to remove, say, your initials as the author of the document and those types of things. Adriana Linares: And I’ll throw one more tip in before I pass this one off to Tom because I happen to know a lot about this. One of the very typical types of information that gets trapped inside of metadata is the previous name of the document. In a law firm, duping and revising something that is very, very typical; so if you created the first motion to dismiss for John Smith and then you keep file save as, dupe and revise that same file over and over again, that metadata might actually continue to say motion for dismiss John Smith case, even though you hadn’t used it for the John Smith case for 15 or 20 files ago. So removing that metadata, I think that’s an important tip for attorneys to know how to do, regardless of whether they’re e-filing or not. It also removes information like name of authors, previous law firm you may have been in, how much time was spent on the document. So there’s a lot of information in there that is helpful to know how to remove. Your video’s only 3 minutes long, so I think that would be a great place for people to go out and spend just 3 minutes of an hour to learn how to deal with that issue. Tom, do you have something that you want to add about metadata? Tom Hall: Well I was going to say, I don’t think I can tell them any better how to do it than the video does. It’s great and when actual people ask me I say go look at the video. But I think what attorneys have to realize is that it’s absolutely critical that they get that information out, partly because they’re potentially revealing attorney-client privilege information. When I was clerk of the court when e-filing first started, attorneys clearly did not understand how to do it or their staff didn’t. And it’s amazing, the stuff that used to come into the court that we would see. Comments about the case, comments about justices on the court, that sort of thing that were out in the margins that they put in when they were doing track change kinds of documents. So people need to understand how to get that information out there. It’s not hard and make sure that they file it the right way. Adriana Linares: That’s great, thank you so much. Well, unfortunately, we’ve reached the end of our very informative program. I just want to ask first Tom and then Carolyn to give us a little bit of contact information for either you or if you prefer to give contact information about where listeners can learn more about the portal and the filing system. At the end here, I’ll go ahead and rattle off the Twitter handle, but Tom, do you want to just sign off and tell us a little bit about yourself where people can reach out to you if they want? Tom Hall: Yeah, the best place to reach out to me is just at my law firm email which is [email protected]. But the best place to find out clearly about the portal is really just by going to the actual e-filing portal. There is amazing information that’s available to them and the rest I was recently reading on was about a year ago, maybe a year and a half ago, was completely redone to make it much more user-friendly. So I think if they have issues about the portal, there’s actually a place there where they could send emails and make suggestions on how to make the website itself easier to use. Adriana Linares: That’s great, thank you so much. And Carolyn, do you have any extra information you want to give to our listeners about where to get more information if they’re looking for it? Tom did a pretty good job at it though. Carolyn Weber: Sure, my email address is [email protected], and you can reach me at (850) 577-4653, and I’m happy to answer any questions or help anyone in any way I possibly can. Adriana Linares: That’s great, thank you so much for that information and of course for your time, we really appreciate it. Thank you to Tom and Carolyn and for all you listeners who would like more information about what you’ve heard today, please make sure to visit the official Florida Bar Podcast on the PRI section of the Florida Bar website. Be sure to follow the Florida court’s e-filing system on Twitter. Their handle is @FLCourtsEFiling. Of course, check out Legal Talk Network. You can follow all of our feeds on iTunes, RSS, Twitter, and Facebook. That brings us to the end of our show. I’m Adriana Linares and thank you for listening. Join us next time for another great episode of the official Florida Bar Podcast.